The Institute of Contemporary Development has published its monthly analytical bulletin for April. The main topics of this issue are: ongoing problems of European integration; global governance and the world economy; Ukraine’s foreign policy stance between Russia and the EU; Lord Robert Skidelsky’s new book. 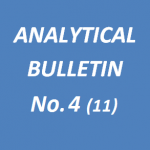 The annotation of Analytical Bulletin No.4 (11) can be found below. The full text of the bulletin in Russian can be found here. Igor Yurgens. How Much Is Enough?